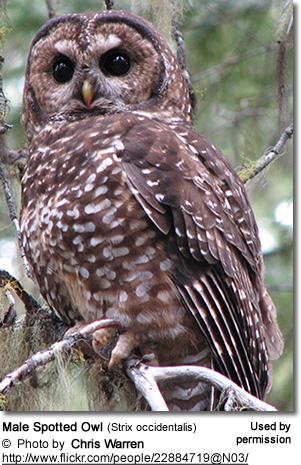 The Spotted Owls (Strix occidentalis) - also known as Western Barred Owls, Canyon Owls, Brown-eyed Owls, Wood Owls and Hoot Owls - are medium-sized owls that are about the size of American Crows. They have gained fame as one of the most publicized and best-studied of all endangered species in North America. They generally only occupy one territory most of their lives and their sedentary nature - combined with strict habitat requirements, confiding disposition and loud vocalizations - add to their susceptibility. Their dependence on large tracts of old-growth coniferous forests has made them vulnerable to extinction due to clear-cut logging and resulting loss of their critical habitat. The larger Barred Owls are also blamed for their declines as they aggressively compete with them for food and nesting sites. In 2011, federal wildlife officials made the very controversial recommendation to shoot 1,200 to 1,500 barred owls every year in three or more study areas from Washington to northern California to relieve pressure on the Spotted Owls. These two species have been reported to hybridize in areas where their ranges meet even though they are genetically quite distinct - differing 13.9% in certain gene sequences. Their interbreeding presents another thread to the existence of this species. 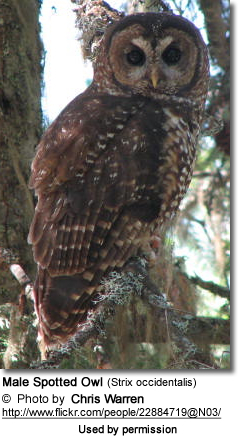 In 2003, wildlife biologist Joe Lint published the results of a study in the "Status and Trends of Northern Spotted Owl Populations and Habitat" which suggests that "an optimistic population estimate might be 100 pairs for British Columbia, 1,200 for Oregon, 560 for northern California, and 500 for Washington." These nocturnal birds typically roost in deep shade during the day, but are generally less reclusive and more confiding than other owls. In fact, they have been described as "tame, unsuspicious, cursory, or stupid"
Within their natural range, the Spotted Owls can most easily be identified by their dark eyes - most other owls have yellow to red-orange eyes. Their plumage is mostly dark brown with a heavily spotted chest. The North American Spotted Owls occur naturally in mountains and coastal forests from Alaska south through British Columbia in Canada and western Washington and Oregon to southern California; and in the Rocky Mountain region of the interior from southern Utah and southwestern and south-central Colorado south through Arizona's mountain ranges, east to New Mexico andextreme northwestern Texas, south to central Mexico. In Mexico, their range stretches from Sonora, Chihuahua, Nuevo León, and eastern Coahuila through the Sierra Madre Occidental and Sierra Madre Oriental mountain ranges as far south as Michoacán - a state located in west central Mexico. This species is mostly sedentary (non-migratory) except for some possible downslope movement from mountains during the winter as they escape the harshest of conditions. Additionally, the California and Mexican Spotted Owl subspecies may migrate short distances (less than 31 miles / 50 km) between their winter and breeding ranges. Juveniles may also disperse in late summer. Females and single males also sometimes disperse from their territories, with an average dispersal distance of 3.8 miles (6.1 km). 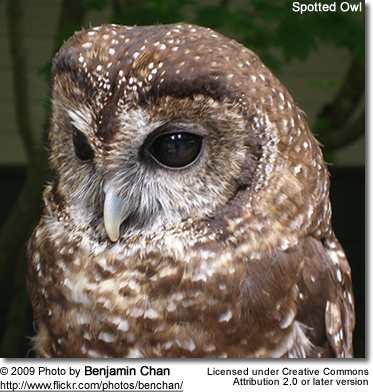 Spotted Owls favor shaded mountain slopes and canyons over flat plateau areas. They mostly inhabit humid, mixed mature forests typically dominated by an overstory of Chihuahua and Apache pines, Douglas fir, ponderosa pine, Arizona cypress or sycamores, as well as occurring in wooded ravines and rocky canyons. Range: Found in southwestern Canada (British Columbia), south along the Pacific coast to northern California. ID: The plumage is the darkest brown of all with the smallest white spots. Range: Found along the central and southern California coast and western slope of the Sierra Nevada, south to northern Baja California. Its range overlaps with that of the nominate in the southern Cascade Range (= major mountain range of western North America). ID: Plumage is lighter brown with larger spots. Arizona Spotted Owl, Mexican Spotted Owl, Mountain Spotted Owl, Mountain Forest Owl (Strix occidentalis lucida - Nelson, 1903) Possibly separate species. Range: Geographically separated from the California or northern subspecies. Its range stretches from northern Arizona north to southern Utah east to southern Colorado and south through the mountains of Arizona, New Mexico and west Texas to the mountains of northern and central Mexico (south to Michoacán and Guanajuato) and possibly into southern Mexico. The largest population is found in the Gila Wilderness located in the Gila National Forest in New Mexico. Status: Considered as Threatened in the United States and Mexico. ID: The smallest and palest of the subspecies, with the largest spots. Dark brown plumage heavily spotted with white on the chest and abdomen, with fewer spots on the wings, back and head. Individuals found along the coastal range have the darkest plumages, while the subspecies occurring in Arizona and Mexico are the palest with the most (or larger) white spots on the head and chest. Bill horn to yellowish in color. Other than the female being slightly larger and having different vocalizations, both genders look alike. Hatchlings to about 5-month old juveniles have a downy plumage. Those age 5 to 26 months resemble the adults, but have pointed, white-tipped rectrices (the long flight feathers of the tail). Adults have rounded and mottled tips. 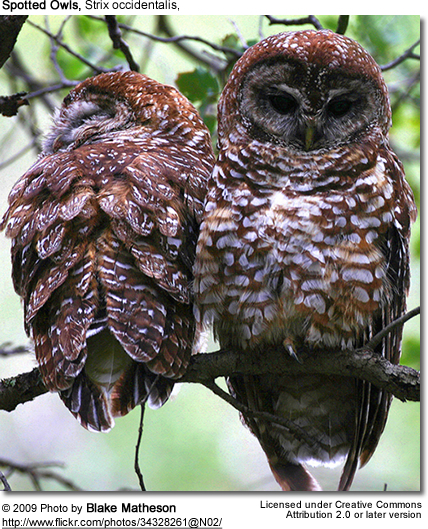 Barred Owls: Barred Owls are larger and size, and have brown vertical streaks on the underside (the Spotted Owl has short brown horizontal bars or spots on its underside). Plumage generally greyer. 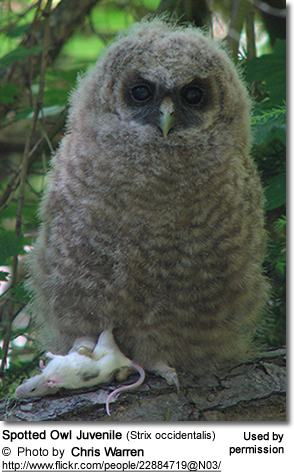 Great Grey Owls: much larger in size; have yellow eyesGreat Horned and Long-eared Owls have ear tufts. Spotted Owls are "perch and pounce" predators that mostly feed on small to medium-sized mammals - such as rodents (mice, rats, voles, gophers, squirrels) and bats; as well as birds, reptiles and arthropods (insects, spiders, worms, etc.). They have also been known to roam around campgrounds to pick up scraps of food. Most hunting occurs at night; however, when under pressure to raise young or when special opportunities avail themselves, they may do so during the daytime as well. They generally locate prey from an elevated perch, swooping down and capturing them with their sharp talons. Birds may be caught in flight. They always eat their prey head first. Spotted Owls reach reproductive maturity when they are about 1 year old, although they may not start breeding until they are 2 - 3 years old. Once they have found a suitable mate, they usually remain together for life; however, they may replace a mate that was lost for whatever reason. Most breeding activity occurs between March to September. Pairs may not breed every year - the availability of food to raise a family with is believed to be a major consideration. Some may not reproduce for five to six years. These birds don't build their own nests; they will usually raise their young in tree cavities; broken-topped trees; deserted raptor (often Northern Goshawk), raven or squirrel nests; rock crevices, in the cavities in sandstone cliffs, on rocky ledges of caves, and deep narrow canyons. Nests are reused over several seasons. The average clutch consists of 2 - 3 white to pearl grey-colored, oval eggs - however, as few as one or as many as four can be laid. The female alone incubates the eggs for about 28 - 32 days, while the male hunts and delivers food to the nest - initially for the brooding female and once the young have hatched, for the nestlings as well. The hatchlings are covered in white down, blind and completely dependent on parental care. When the chicks are about 5 weeks old, they start climbing out of the nest and roam around in nearby branches. They start flying when they are about 6 weeks old and by the time they are 9 - 10 weeks old are quite capable of capturing insect prey by themselves. However, the young will remain with their young until the young disperse in the autumn. Contact call: series of whistles and a siren-like echo. Alarm / scolding calls: 3 to 7 loud, rapid dog-like barks; as well as various grunts, groans, and chatters. Female will emit loud "co-weeep" vocalizations to contact her mate. The oldest recorded Spotted Owl lived 21 years. Captive birds usually live 15 - 20 years. In the wild, the juvenile survival rate is very low. 60 - 95% of them don't make it to adulthood. Many of them starve to death, while others are preyed on. Natural predators include the Common Ravens, which feed on the eggs and young chicks; the Red-tailed Hawks, which prey on the chicks; and he Great Horned Owls, which prey on both the adults and young. In the wild, the mortality of the adults is estimated to be 5 - 20% annually. Those that survive the nestling and juvenile stages can live as long as 10 years.